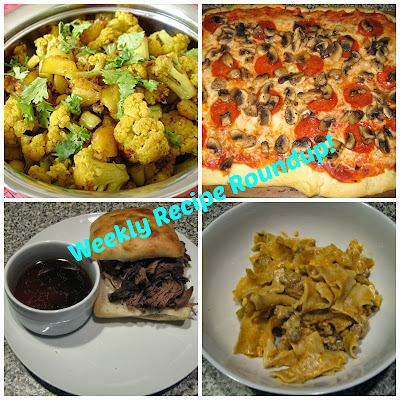 I tried some really fantastic recipes this week, including my go-to pizza recipe. I usually make pizza for dinner every 2-3 weeks and it's definitely a favorite at our house! I tried one recipe this week that wasn't a big hit. It was by no means bad, just a little lackluster. Take a look at the recipes and recaps below and let me know what you've been cooking this week! This recipe is for Aloo Gobi, which is kind of hilarious to say out loud, but wasn't a huge hit in our house. We love curries and Indian food but this one was just kind of bland. I feel like I could have amped it up with more veggies and spices, but then it wouldn't be Aloo Gobi anymore, it would be like one of my other veggie curry recipes. However, my 15-month-old seemed to be a fan of it so it's not a total loss by any means. It's a simple recipe, so if it's one you like, give it a try at home and let me know if you discover any tricks to make it more flavorful! Pizza. One of the major food groups in my opinion! If I was pressed for a favorite food I might have to say pizza. Any kind, really, I love BBQ chicken pizza, conventional cheese/margherita pizza, breakfast pizza, and the list goes on. I've shared my recipe for our favorite focaccia-style crust on the blog before, so check it out below. It really doesn't get any easier than this, just add your favorite sauce, cheeses and topping and enjoy! As much as my family loves pizza, I think the reigning favorite recipe of the week had to be these amazing slow-cooker beef sandwiches. As a bonus, I received a painful badge of honor courtesy of turning the meat in the slow-cooker and splashing my face with the insanely hot broth. Thankfully I was able to ice and aloe the burn immediately so there's no scar or damage, just a tender cheekbone and sore eyelid! Injuries aside, this recipe is fantastic. Super-easy and amazingly delicious. It's perfect for leftover sandwiches too! My final recipe of the week was met with a surprising amount of enthusiasm. Don't get me wrong, I assumed the dish would taste good, but it was kind of a thrown together casserole-style recipe that I don't do that often. I tagged it as an ideal dinner for the end of the week when I'm getting a little worn out from work and cooking. It took less than 30 minutes to prepare and my husband and I were visibly shocked at how delicious it was! I served it up alongside a big green salad and we'll definitely be trying it again. I might throw in some black beans next time, but it was delicious as-is as well! Next week we're going apple-picking so be sure to check in the end of next week for some of my favorite seasonal apple recipes!